Its summer all year long in sunny San Diego so how do you cool down, with ice cream of course! From creatively-flavored artisan ice cream to Instagrammable frozen desserts, the city is bursting with tasty cold and creamy deliciousness. Here’s a list of our favorite not to miss ice cream shops that will leave you licking your lips and planning your return visit before you finish your sweet treats! Whether you’re looking for a San Diego tour devoted to ice cream, or simply want to try a new spot, you’ve come to the right place! Nope, you didn’t read that wrong – this place serves up some of the best small batch gelato in the city! Their storefront is located in a historic building in University Heights and instead of changing the name of the previous tenant, they decided to keep it and adapt their brand to fit! Crafted by an experienced European gelato maker, the flavors are cleverly named after fabrics but are inspired by seasonal produce found at the local farmer’s markets. Our favorite is the Velour, a mix of caramel and black lava sea salt! Check out An’s Dry Cleaning for desert after a craft cocktail at one of our favorite North Park Bars! These island-inspired homemade ice cream shops are owned by a local family and opened its first location in North Park but also has shops in Point Loma and Pacific Beach. 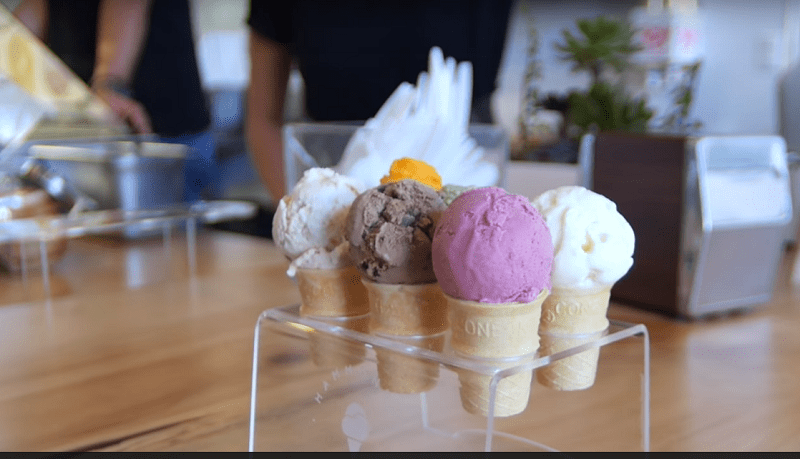 This gourmet ice cream shop offers a rotating menu of over 300 flavors of Tropical Dreams super premium Hawaiian ice cream and sorbet and created an ice cream “flight” that allows ice cream lovers to taste up to 6 flavors at a time! Our favorite ice cream flavors are the Chocolate Coconut and Mango Cream served in one of their homemade waffle cones. Go get yourself a scoop to satisfy your sweet tooth today! This Pacific Beach location is famous for their Milky Bun, a glazed or unglazed donut stuffed with scoops of one of their unique ice cream flavors then warmed to a just right melt-in-your-mouth consistency that creates a hot cold affect you can’t find anywhere else. They feature at least a dozen unique ice cream flavors and are open 12:00 pm – 12:00 am daily to help satisfy that late-night sweet tooth. Head here for a sweet treat after having brunch in Pacific Beach! This family owned and operated business is located right by the pier in Ocean Beach and offers a huge variety of malts, cones, sundaes, frozen yogurt options, and sorbets but is best known for their famous Hot Waffle Ice Cream Sandwiches! You can choose from different waffle flavors, pick your ice cream and then add toppings including options like strips of salty bacon or classic hot fudge – have them make it a sundae and it will come stacked with all the fixings! Started 10 years ago they debuted as a little ice cream cart at the Little Italy Mercato. You can still find them there on Saturdays as well as 4 other local markets, but they now also have a shop in Normal Heights. Their gourmet, organic, all-natural sweet treats feature fruits and herbs sourced locally from farmer’s market vendors and their creative flavors include concoctions like Lavender Lemonade, Mojito, Spicy Mango Chili and Goat Cheese Cherry Cheesecake. This Kensington shop feels a little like you are walking into a nostalgic diner with milkshake machine and all. They source their ice cream from Fosselman’s Ice Cream Company which has been around since 1919. In addition to a rotating 16 flavors served in traditional cones, cups, sundaes, cookie ice cream sandwiches or milkshakes, they also have Ice Cream Pies, Ice Cream Cakes and our favorite The Sparkler – a ginger ale float with your choice of sorbet! Located in the Gaslamp Quarter next to Petco Park, this small place makes all of their own ice cream, frozen yogurt and sorbet from scratch right in their shop! Select from a variety of flavors and pick your toppings and they will mix it all together on a frosty slab creating your own unique creation right in front of you! You can put your creation in a waffle bowl, chocolate dipped cone or our favorite, between two fresh-baked cookies for the best ice cream sandwich you’ve ever had! For a small island, the luck is in their favor to have two locations of this great place! One is located on the busy Orange Avenue and the other is located inside the iconic Hotel Del Coronado! They have dozens of combos of homemade ice cream to choose from; just pick your favorite ice cream, frozen yogurt, sorbet or sherbet and whatever toppings you’d like, and they smash them all together on a frozen granite counter and put it into one of their delicious waffle cones or a cup of your choice. If you’d like to try something a little different than the traditional, check-out their dessert nachos consisting of a pile of waffle cone chips and 3 scoops of your favorite flavors or the Moo Tacos – yes, ice cream tacos! This La Jolla gem is less than two blocks from La Jolla Cove. Grab a cup of their organic gelato, made-in house everyday from scratch and walk down to the park or eat it on one of their cute outdoor tables with ocean views. They change their flavors everyday and have an updated list on their website you can review before stopping in. They always have at least 6 dairy free sorbet options for those looking for something lighter. Don’t let the line scare you away, it’s a small shop but they work quickly and are very friendly. They also have a full espresso bar and offer an Italian favorite of ours – Affogato, your choice of 2 scoops of gelato drowned in a double espresso! If all of these have you drooling and you can’t choose a place to start, consider a San Diego Tour offering a sampling in different neighborhoods of our favorite ice cream, food, drink and dessert options. You’ll meet new friends, learn more about San Diego History, and be left satisfied you’ve had some of the best San Diego has to offer.